Aphis cytisorum is a very dark green aphid which may appear greyish because of the strong wax secretion (see pictures below). 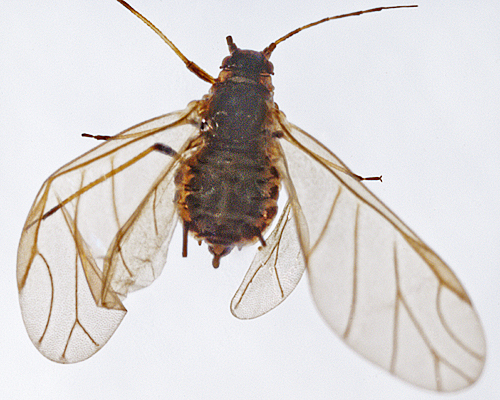 The adult aptera has a dark sclerotized dorsal abdominal shield, which is often rather fragmented and variable in size, and is especially reduced in small specimens. The dark sclerotic areas are strongly reticulate. There are areas of membranous cuticle along the side bounded by the mid-dorsal shield and the intersegmental muscle sclerites. The apical rostral segment (RIV+V) is 0.97 to 1.3 times the length of the second hind tarsal segment (HT2). Marginal tubercles may be present. The longest tibial hairs are a little longer than the least width of the hind tibiae. The siphunculi and cauda are dark, but the antennae and tibiae are mostly pale. The siphunculi are 1.2 to 2.2 times as long as the cauda. 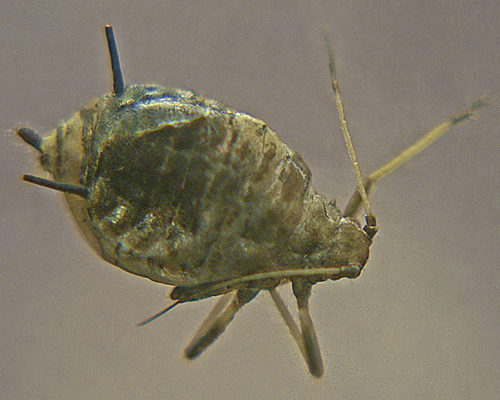 The body length of apterae is 1.4-2.5 mm. Alates have the dorsal shield broken up into segmental bands, marginal sclerites and postsiphuncular sclerites, with areas of membranous cuticle along side the segmented bands on the abdominal tergites, as can be seen in the second micrograph below. 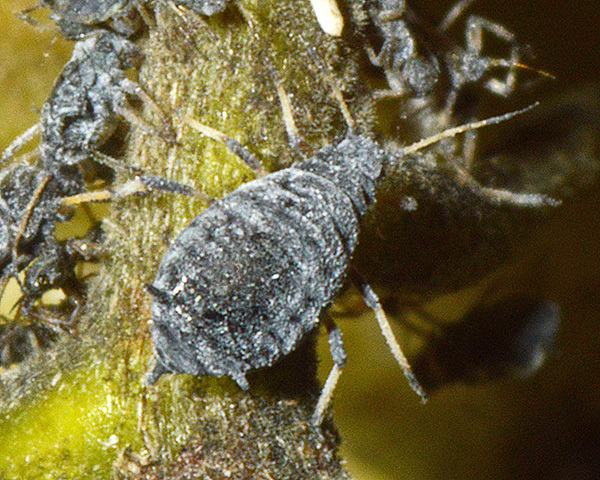 Aphis cytisorum is one of three 'black-backed' Aphis species living on woody Fabaceae (the other two are Aphis craccae and Aphis craccivora). It is very similar morphologically to Aphis ulicis (which only feeds on gorse) from which it differs only by the length to basal-width ratio of the apical rostral segment. This ratio is less than 3 for Aphis cytisorum and more than 3 for Aphis ulicis. Aphis cytisorum sarothamni (broom aphid) which feeds on broom (first picture at top of page). Aphis cytisorum cytisorum (laburnum aphid) which feeds on laburnum (second picture at top of page). The only morphometric difference between these two subspecies is that the oviparae of Aphis cytisorum sarothamni have more swollen hind tibiae with many more scent plaques than Aphis cytisorum cytisorum. Aphis cytisorum does not host alternate. The laburnum aphid (Aphis cytisorum cytisorum) lives on the leaves, stems and seed pods of laburnum (Laburnum anagyroides) or Spanish broom (Spartium junceum). The broom aphid (Aphis cytisorum sarothamni) lives on broom (Cytisus scoparius). Both subspecies are usually ant attended. Sexual forms occur in autumn. Aphis cytisorum is found throughout most of Europe eastward to Russia and Turkey. It is also found in North Africa, China, North America and parts of South America. We have found the broom aphid (Aphis cytisorum sarothamni) quite frequently, in fact wherever there is broom (see picture below). The laburnum aphid (Aphis cytisorum cytisorum) seems markedly less common, and we have only found it at Rye Harbour in East Sussex (see picture below). 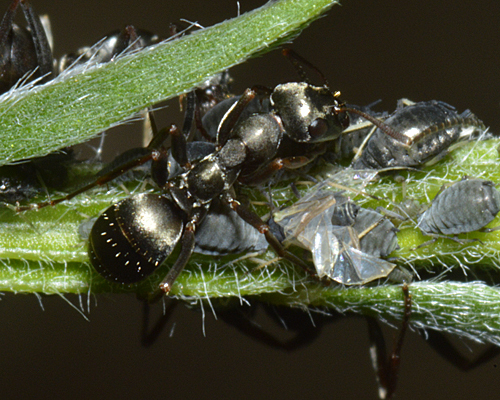 Both subspecies of Aphis cytisorum are facultatively ant attended. We have found ssp. sarothamni being attended by Formica lemani (see first picture below) and Lasius in Scotland. In southern England, the attending ants were Formica rufa (see picture below) and Lasius. The phloem sap of Cytisus scoparius contains high levels of quinolizidine alkaloids which is most likely toxic to ants. 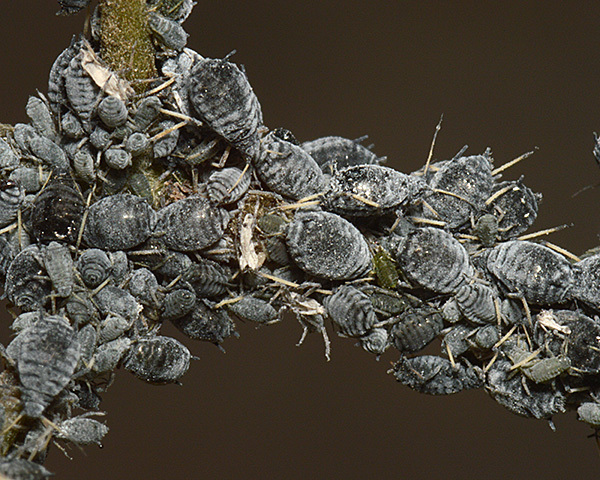 Presumably most of this is removed and stored by the aphids - otherwise the (polyphagous) ants would not be able to harvest the honeydew. However, Szentesi & Wink (1990) showed that Lasius niger which collected honeydew from an Aphis cytisorum colony contained about 45 ug/g fresh weight quinolizidine alkaloids, mostly cytisine. 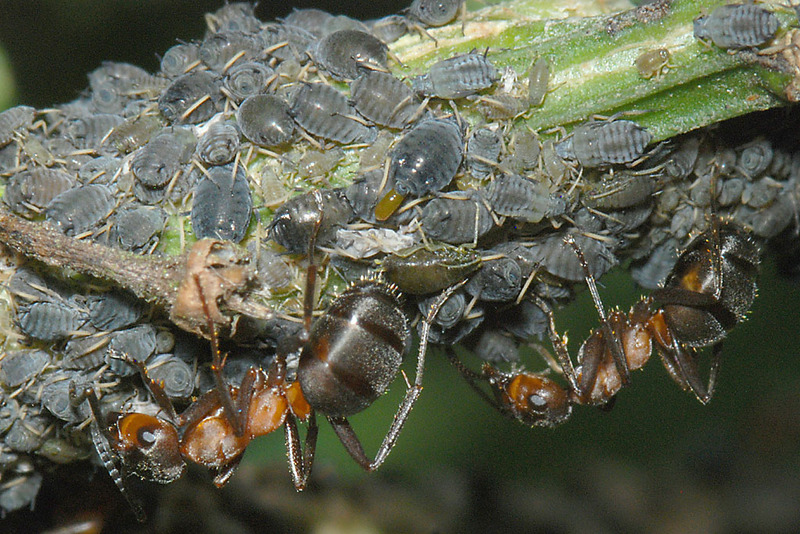 The effect of such levels of alkaloids on the ants is unknown. We have found very few predators attacking Aphis cytisorum sarothamni, although the picture below shows a midge larva (Aphidoletes) predating an aphid in one colony. 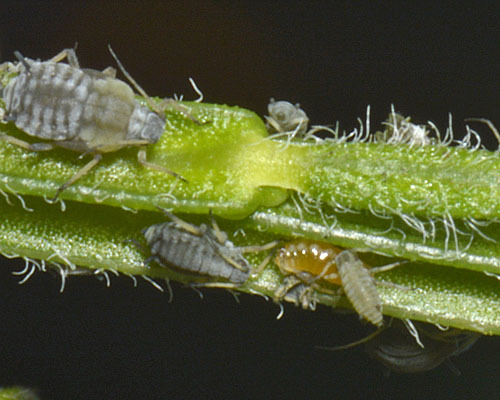 The scarcity of predators is almost certainly because of the presence of high levels of quinolizidine alkaloids, which these aphids accumulate from the broom. 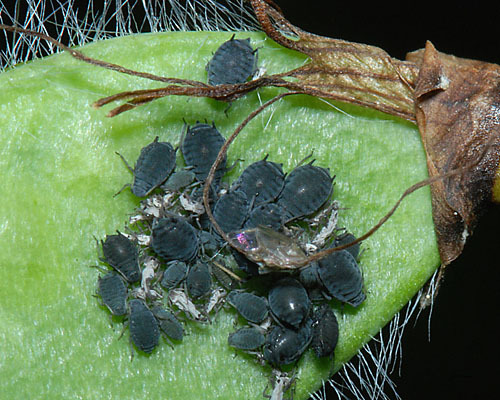 The monophagous Aphis cytisorum sarothamni is able to detoxify or otherwise survive the effects of the alkaloids. 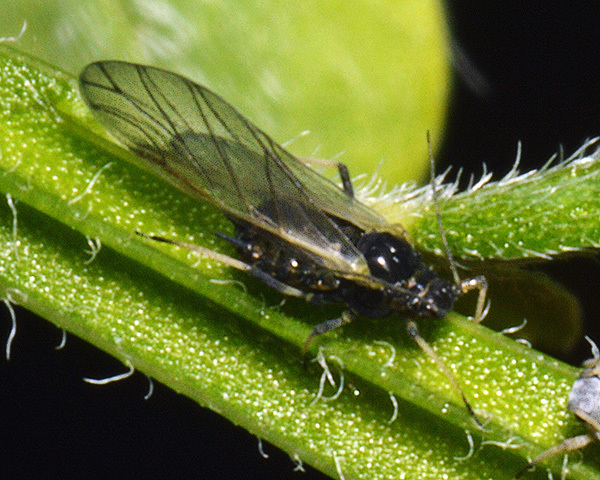 Nevertheless Wink et al., 1982 showed that the alkaloid content of aphid infested plants was about 50% lower than that of uninfested plants, indicating that even Aphis cytisorum avoids plants with the highest levels. Blackman & Eastop list about 14 species of aphids as feeding on broom (Cytisus scoparius) worldwide, and provides formal identification keys. Of the 9 species on common broom (Cytisus scoparius), Baker (2015) lists 8 as occurring in Britain: Acyrthosiphon caraganae ssp occidentale, Acyrthosiphon pisum, Aphis craccivora, Aphis cytisorum ssp. sarothamni, Aulacorthum solani, Ctenocallis setosa, Myzus persicae and Neomyzus circumflexus. Blackman & Eastop list 5 species of aphid as feeding on laburnum (Laburnum anagyroides) worldwide, and provide formal identification keys. 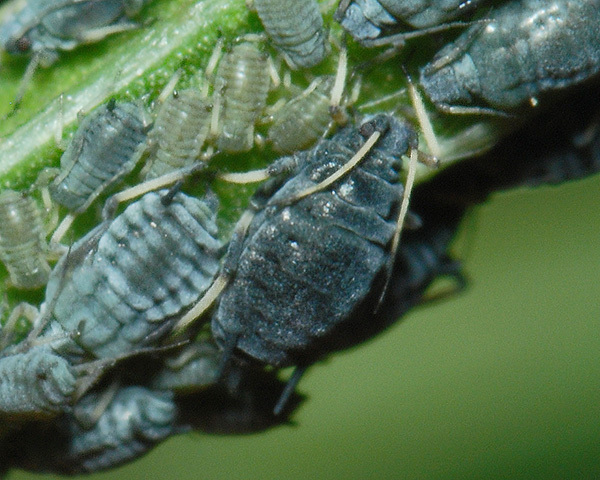 Of those aphid species, Baker (2015) lists all 5 as occurring in Britain: Acyrthosiphon caraganae ssp. occidentale, Acyrthosiphon pisum, Aphis craccivora, Aphis cytisorum and Myzus persicae. Blackman & Eastop list 6 species of aphid as feeding on Spanish broom (Spartium junceum) worldwide, and provide formal identification keys. Of those aphid species, Baker (2015) lists 5 as occurring in Britain: Acyrthosiphon pisum, Aphis craccivora, Aphis cytisorum, Aphis fabae and Aphis genistae.